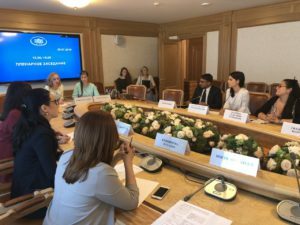 On July 25, as part of their visit to Russia, the representatives of the National Youth Forum of Italy visited the State Duma. Foreign guests were greeted by First Deputy Head of the State Duma Apparatus of the Russian Federation Sergey Pospelov. Then they visited an excursion organized for them at the historical and new buildings of highest legislative body of our county. During the visit, a meeting was held between the Italian delegation and representatives of the Youth Parliament under the State Duma. The Russian side was represented by the State Duma deputy Natalia Kuvshinova, Chairperson of the Youth Parliament under the State Duma Maria Voropayeva, Deputy Chairperson of the Youth Parliament under the State Duma Elena Erakina, Coordinator of the National Youth Council of Russia international programs Valeria Dubravina and the Press Secretary of the National Youth Council of Russia Elena Marchan. At her welcoming speech, Natalia Kuvshinova stressed that public diplomacy is very important for the Youth of Russia and Italy, as it gives them the opportunity to communicate and share their views on various issues. The deputy especially noted Italy’s contribution to the preparation and holding of the 19th World Festival of Youth and Students in Russia in 2017. «It is very important for us to see how the state youth policy in other countries is being implemented. The problems that young people face in Europe are in many ways identical to those our youth also go through. We would be very grateful if you share your experience on how today representatives of your country help youth to develop,» she said. Chairperson of the National Youth Forum of Italy Maria Cristina Rosaria Pisani thanked the Russian representatives for hospitality. «I am confident that this visit will be the beginning of a long and fruitful cooperation. It is very important for our organization to establish cooperation with Russian youth organizations,» she said. During the meeting, the sides exchanged their experience connected to youth work in their countries and outlined plans for further bilateral cooperation in various areas.